The application compatibility toolkit (ACT) is a great tool for analyzing compatibility of apps when doing a migration of Windows. However, the available “reports” are limited in what they display out-of-box. Fortunately since the tool is a SQL database, we can write our own queries to get what we need. The below procedure/query will identify business specific apps and the detected compatibility issues. This entry was posted in How-To, Scripting and tagged App Compat Toolkit, SQL. Recently came across a situation where my ACT 5.6 server suddenly ceased processing log files and the directory had filled up with .cab files. As I had previously learned, the first quick thing to check is that the log processing [Windows] service is started. In this case it was started, but the .cab files were stuck. In turning to the event logs, I there was a warning message for ACT-LPS code 1017 with message “listener.exe verification for directory \\server\share fails”. As it turns out, the fix was simple. Somehow ACT had accidentally become configured to just use the \\ServerName\ and it did not have the logs directory. 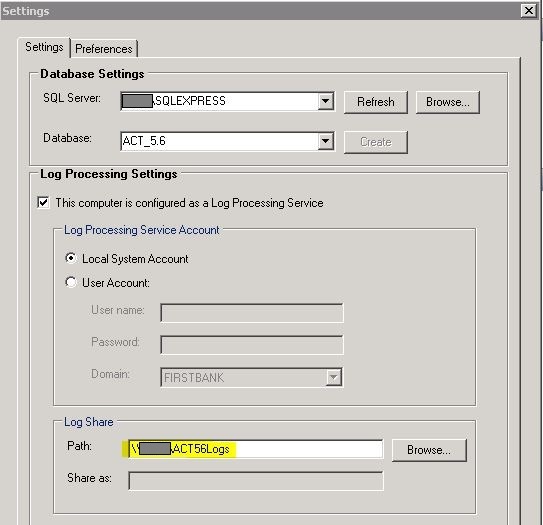 By resetting it to include the correct path, the service began processing all the logs again! This entry was posted in Troubleshooting and tagged App Compat Toolkit.